Bank of England governor Mark Carney and France's François Villeroy de Galhau set out the dangers to the global economy in an open letter. 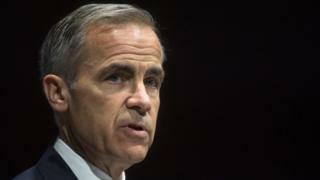 In the letter published by the Bank of England on Wednesday, Mr Carney and Mr Villeroy de Galhau describe "the catastrophic effects of climate change" already having an impact on the planet, such as "blistering heatwaves in North America to typhoons in south-east Asia and droughts in Africa and Australia". The NGFS elaborates in its "call to action" report, saying that climate change will lead to "disruptive events such as mass migration, political instability and conflict". This is why world leaders signed the Paris climate agreement in 2015 and committed to reducing their respective countries' carbon emissions, the letter continues, in order to limit the global temperature rise to well below 2 degrees Celsius. "But this transition brings its own risks," they add. It is the second risk in particular - of switching to a green economy without proper planning - that Mr Carney and Mr Villeroy de Galhau focus on in their letter. "Carbon emissions have to decline by 45% from 2010 levels over the next decade in order to reach net zero by 2050. This requires a massive reallocation of capital," it reads. The full NGFS report adds that "while urgent action is desirable, an abrupt transition could also have an impact on financial stability and the economy more broadly". "The speed and timing of the transition is crucial," it continues. "An orderly scenario, with clear policy signalling, would allow adequate time for existing infrastructure to be replaced and for technological progress to keep energy costs at a reasonable level. "In contrast, a disorderly, sudden, uncoordinated, unanticipated or discontinuous transition would be disruptive and costly, particularly for those sectors and regions that are more vulnerable to structural change." Companies and industries that do not adjust or properly plan for these changes, Mr Carney and Mr Villeroy de Galhau say, "will fail to exist". They suggest that companies "integrate the monitoring of climate-related financial risks into day-to-day supervisory work, financial stability monitoring and board risk management". In simpler terms - businesses need to make climate change planning an everyday thing. They also say that central banks should "lead by example" by making their own operations more sustainable. "An important element to achieving effective consideration of climate risks across the financial system is to support internal and external collaboration," they write. The NGFS has also called for regulators to come up with a classification system that shows exactly "which economic activities contribute to the transition to a green and low-carbon economy". "We need collective leadership and action across countries and we need to be ambitious," they add. "The NGFS is the core of the response of central banks and supervisors. But climate change is a global problem, which requires global solutions, in which the whole financial sector has a crucial role to play."